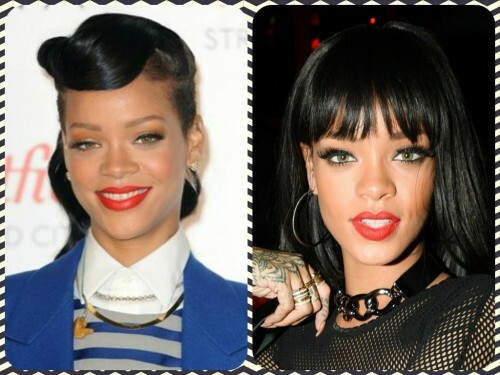 Home > Plastic Surgery > Has Rihanna Had Plastic Surgery?! Has Rihanna Had Plastic Surgery?! Rihanna – the stunning and very talented starlet behind such hits as Umbrella, Disturbia, Only Girl In The World, and much more. She’s the centre of the limelight at every occasion it would seem, with daring outfits, and even more daring hairstyles. One thing it would appear that does come under scrutiny when you are in the public eye just like Rihanna is your body. Sadly, not even this beaut has managed to escape the celebrity plastic surgery rumours. As beautiful as she is, it would appear that not everything is as nature as it seems. There have been numerous reports of her undergoing rhinoplasty (nose job) to achieve a thinner, more defined shape to match her beautifully chiselled face. We thought we’d start with this Rihanna plastic surgery rumour seeing as it appears to be the most prolific. When you look at the following two photos of Rihanna, you can see that her nose shape does appear to have changed somewhat. It no longer appears to be quite as broad at the tip as it did before, and we’re not sure that this is something that could easily be achieved by makeup alone. It does appear that the shape of her owe has changed somewhat … Could celebrity plastic surgery be the reason behind this? Another thing that appears to have changed when you look at the above picture is the shape of her lips. The cupid’s bow on the top lip appears more pronounced these days. It could be a clever makeup trick, of course, but there are also rumours that the Rihanna plastic surgery list could even include lip work. What do you think? Smart makeup or has she gone under the surgeons knife? To be fair, Rihanna is just finding her feet in the crazy music world and she’s come a long way since her Pon de Replay days. Of course she is going to have changed, and in more ways than one. She’s matured as a woman – when we first saw her, she was a teenager. There are going to be some changes to her shape, including her lips and nose. Does this mean that she has joined the long list of people and undergone celebrity plastic surgery? We aren’t sure whether or not there is enough evidence to support the rumours doing the rounds. One thing is for sure however – we are sure many, many people will be waiting for any sign that she is not as natural as she makes herself out to be. As of yet, she has made no attempt to confirm or deny any of the plastic surgery reports.